Every day each company has challenge how to win the rally with competors. How to determine a path to the successful business? 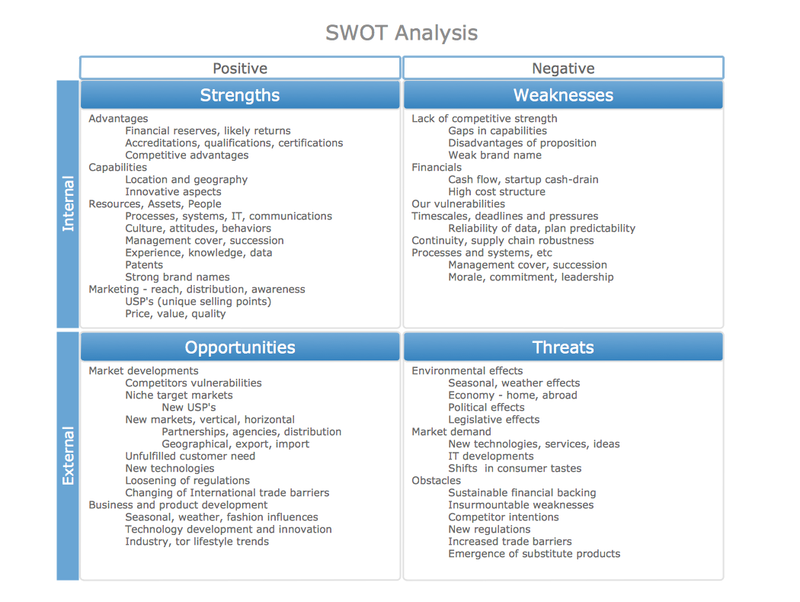 The one of best methodologies is SWOT Analysis. 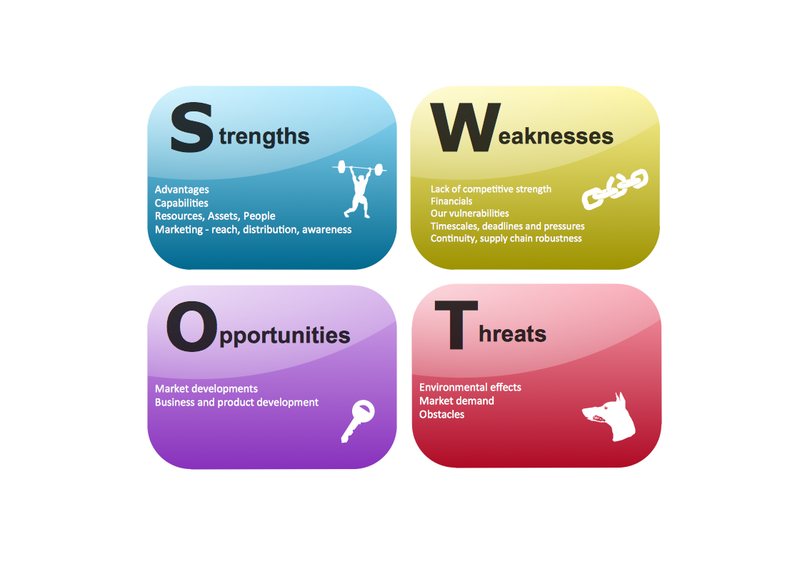 Abbreviation SWOT definition: S = strengths, W = weaknesses, O = opportunities, T = threats. 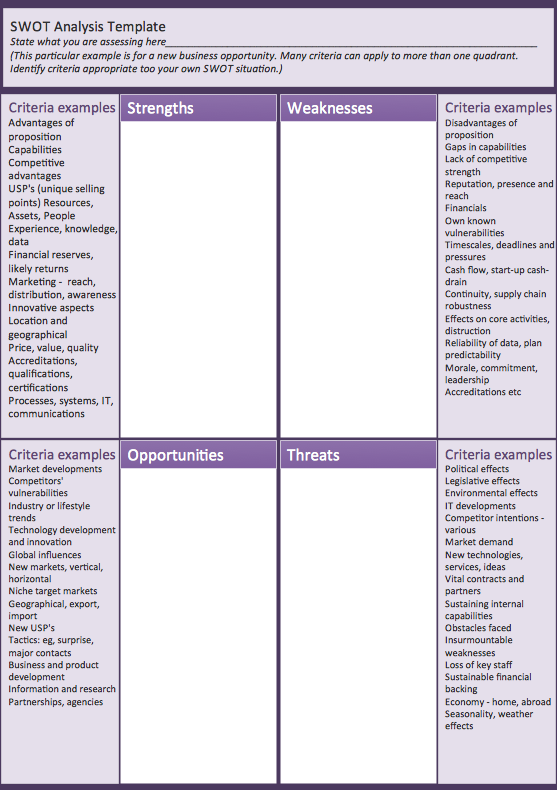 Often named SWOT Matrix was introduced first at 1960s as examining tool of internal capabilities and possibilities of big companies. 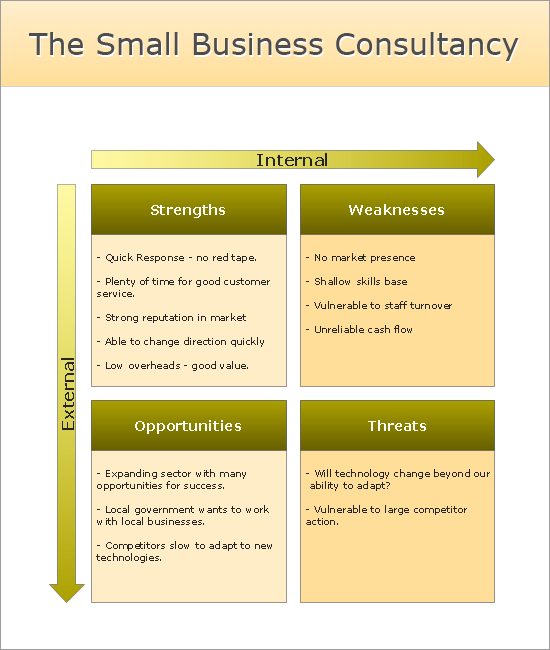 The SWOT analysis aim is to find critical factors influenced to company's business goal. You can begin a strategy to distinguish better competition value and to become successful in your market. Achiving best results form SWOT analysis can be reached when several employees will be involved at the process. Management, sales and customer service can all offer reasonable comprehension competitive situation. The very well structured planning method with help of which it is convenient to evaluate the four main elements of the way of running some organization (commercial or charitable), project or any other business structure or business venture is called a SWOT analysis. Such analysis can be carried out for a particular person (such as a potential supplier of goods, for example), your own or somebody else’s company, some definite product, place (for having office, for instance), or industry in general. Conducting SWOT analysis involves specifying the main objective of some particular business project as well as identifying both external and internal factors, which can help or stop from achieving that goal. Mentioning the elements of SWOT analysis, which are Strengths (particular characteristics of some business project or business as a whole, which are beneficial), Weaknesses (particular characteristics of some definite business, which place it at a disadvantage relative to the other characteristics of this business), Opportunities (particular elements, which can be used in some business or project and which can help in terms of achieving some definite objective) and Threats (particular elements that can potentially cause troubles to some business project or business in general). Identifying SWOT analysis is always a very important constituent of running your own business as all of its elements show which actions have to be carried out in order to achieve the very main objective. First of all, all of the decision-makers have to sit down, discuss and consider whether that main objective is potentially attainable at all. If the main objective cannot be attainable, then they must replace it with a different objective and after to repeat the process of analysing the situation, taking into consideration all of the elements mentioned above. All of the users of SWOT analysis, mentioned in a way of matrix, have to ask themselves and so to answer the questions they are curious about. These questions are the main part of the analysis as they will help to generate the meaningful information for each of the categories, mentioned above (which are strengths, weaknesses, opportunities and threats of the business organization). To make this analysis useful and to find the competitive advantages of a particular project, everyone, who is involved in making these big decisions of where the company personal should head to, considering the main objective which is planned to be achieved, should be asking these questions to themselves and to each other. What are the strengths of this company? What are the weaknesses and what to do about them in order to win this race with the closest competitor? What are the opportunities and how and when to make a use of them? What are the threats which can lead to the organization and so its members’ failure? Knowing the answers to these questions will lead to the filling the gapes in the columns of the SWOT matrix and so they all can be analysed by the head of the company and so the decisions can be made. Once you know what to mention in all of the cells of the SWOT matrix, then you can start making it, but before you create it from a scratch, we want to recommend you to save your time, not to waste it, but to use already made template – one of those which are available for the users of ConceptDraw DIAGRAM software. Saving your time and so your money can be done with ConceptDraw DIAGRAM software as this is the one of only a few similar (but still not as good applications), which allows to get all those that much needed samples and templates of already created charts, flowcharts, diagrams, schemes, plans and matrices by IT professionals who know very well what exactly should be done to the drawings, analogically to the SWOT matrix. The CS Odessa team of professionals, knowing all about the drawings and so the applications existing for the purpose of making such tables and schemes, have developed this unique application, which can change your life completely by offering the already made schematics which you can always use as your drafts and so end up having very good looking and smart drawings within only a couple of minutes. Downloading ConceptDraw DIAGRAM software allows you to get ConceptDraw STORE as another application which can be used for downloading any needed solutions full of all of the needed stencils and templates. Each of the providing solutions include the stencil libraries (at least one) and pre-made samples available for ConceptDraw DIAGRAM software users any time they would want to use any, some or all of them. That unique feature of this software attracts lots of users from all over the world, especially those people who deal with drawings like this all the time working on their laptops and computers creating great looking plans, charts, flowcharts, diagrams and maps. This software can be also very useful for those who do not know as much about using the drawing applications as we always provide the new users with support and advices. You can find so many of the articles describing all of the elements of our application as well as how to use it in the most rational way. You can also find so many videos which were made for the same purpose – to explain how to make the best out of using this software. If you still have questions left after checking for what you are interested in, then we will be happy to help you through the support center. 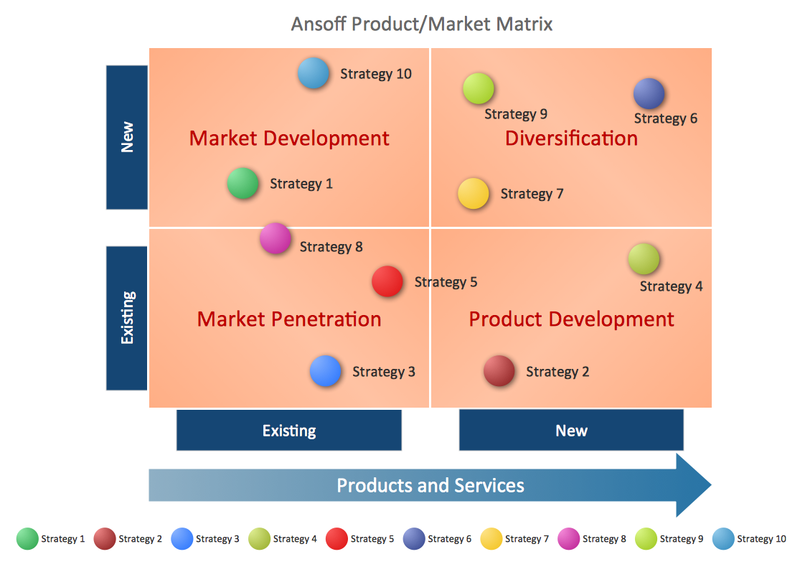 Here the list of provided examples: Ansoff Product Market — Positioning Matrix, SWOT Analysis Government Contract, Analysis Scale of SWOT Factor, SWOT Matrix Educational, SWOT Analysis Matrix, TOWS Mind Map for Social Media Marketing, SWOT Analysis, SWOT Matrix and TOWS Analysis Instructional Sample. 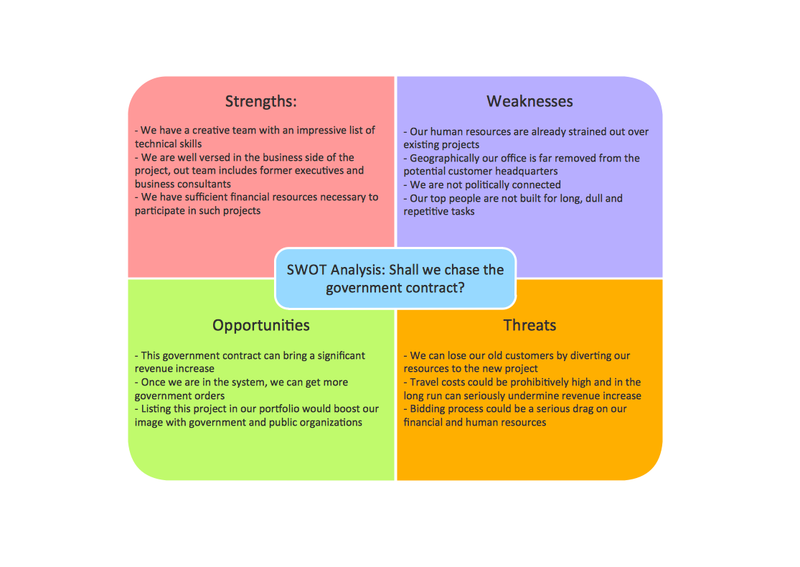 The SWOT Analysis solution from Management area of ConceptDraw Solution Park contains set of examples, templates and vector design elements of SWOT and TOWS matrices. It helps you to quckly draw SWOT and TOWS analysis matrix diagrams using ConceptDraw DIAGRAM diagramming and vector drawing software. 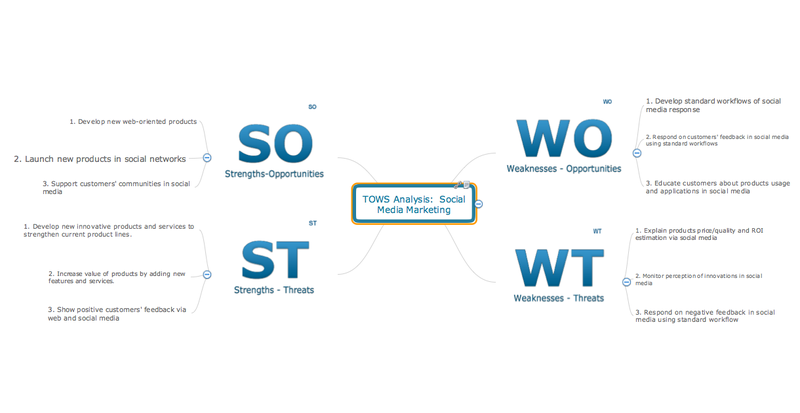 Solution SWOT and TOWS Matrix Diagrams contains mind map templates to be filled in, that help identify Strengths, Weaknesses, Opportunities, and Threats, as well as outputs to ConceptDraw DIAGRAM allow create SWOT Matrix in just one click for presenting analysis results. If you have no time, you can create a SWOT diagram even on asphalt using a chalk. Although, in case you want a proper scheme, you should use a special software for creating SWOT analysis diagrams that would be comprehensible. 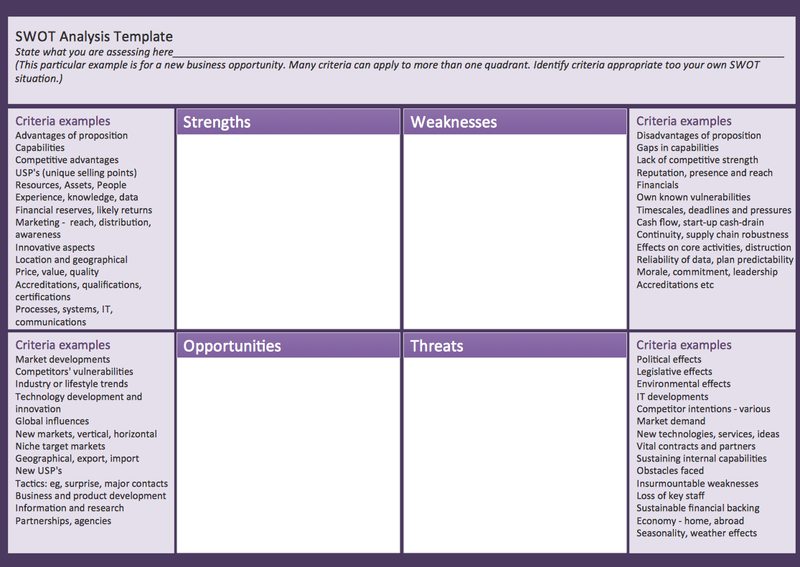 SWOT analysis is useful not only for business purposes, but even for cities or for a particular person. 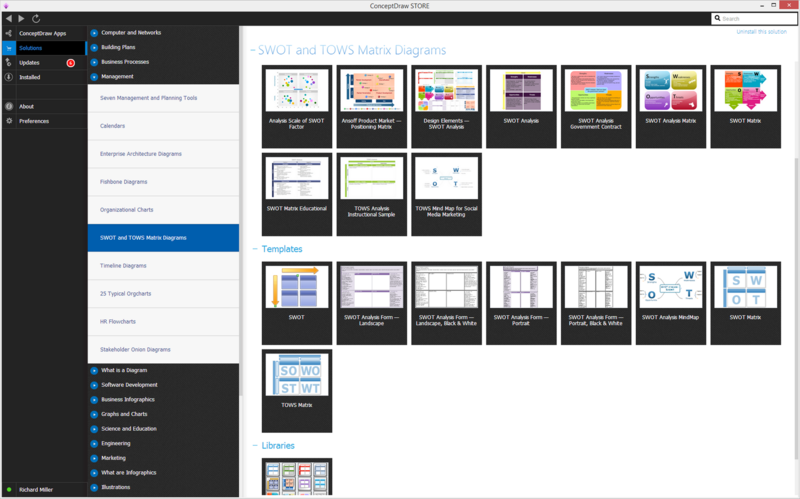 The ConceptDraw SWOT and TOWS Matrix Diagrams solution is a tool for performing both SWOT and TOWS analysis. It provides templates of different sorts of Matrix Diagrams. Besides different embedded templates, the solution enabling create custom SWOT and TOWS matrices. Using the compatibility between the MINDMAP and PRO is the best way of making SWOT or TOWS diagrams quickly. The mind map templates help identify the core statements of SWOT and TOWS analysis: Strengths, Weaknesses, Opportunities, and Threats. The next step is matrix creation - both SWOT and TOWS analysis use the same basic steps and the only difference is the order in which these criteria are studied. SWOT analysis makes it possible to form a strategy for a company and takes into account its characteristics. 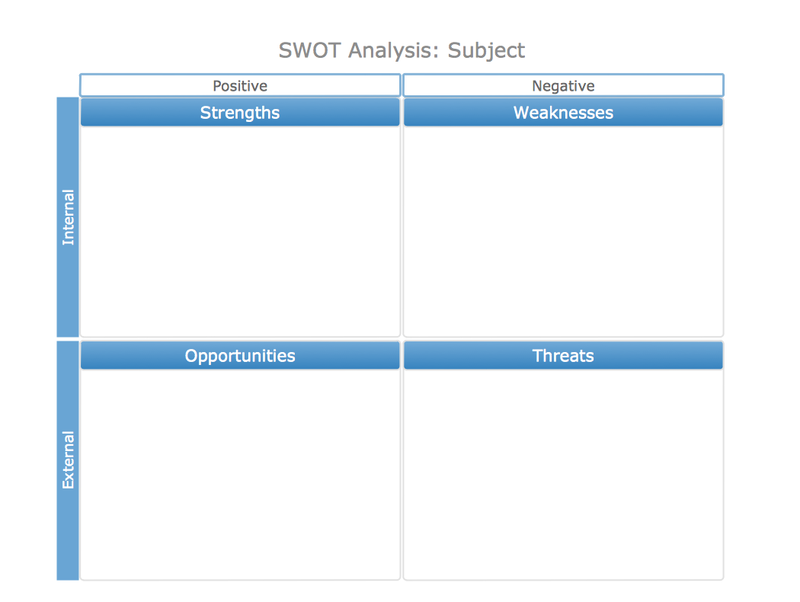 To understand the idea, you can view Swot Analysis Examples for Mac OS X and see how this tool can transform the business strategy. The main point is to adapt to the environment, or to try to influence on it. 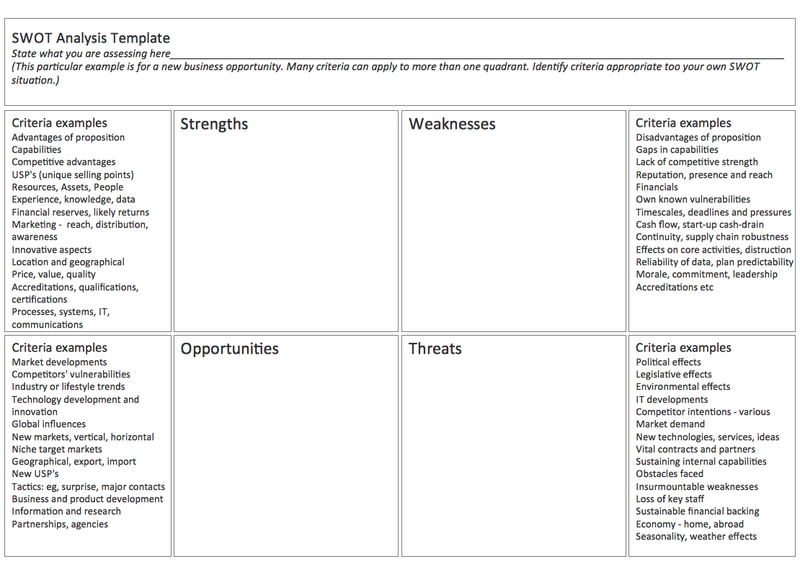 This matrix of was designed to assist business manager in conducting of SWOT analysis. It will help to determine the position business takes regarding competitors and perspective of the further development. 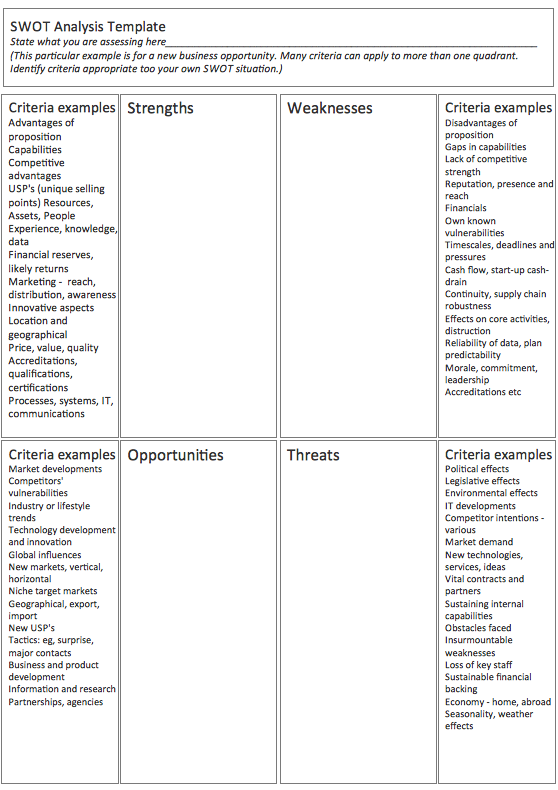 The factors of SWOT are depicted as bubbles on a chart. The coordinate axes are size (X) and importance (Y). 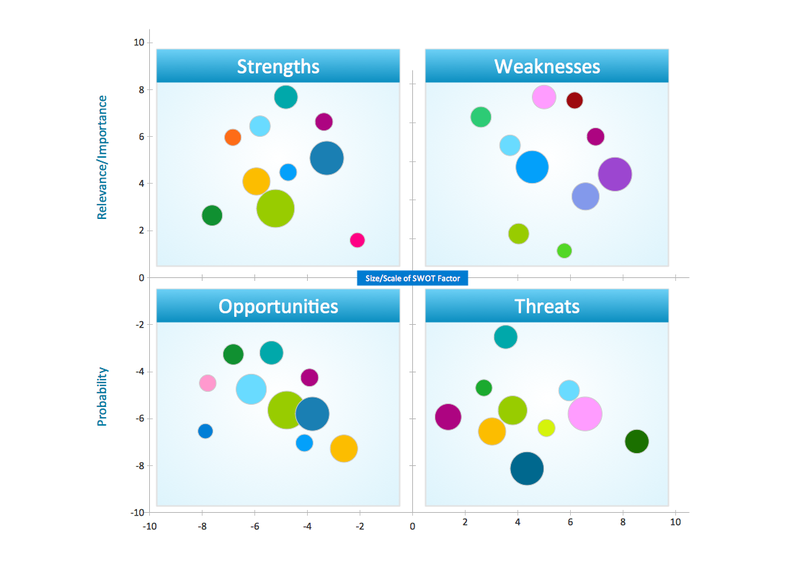 The each bubble's diameter shows the strategic influence of the particular SWOT factors. Moreover, the ConceptDraw solution for SWOT Analysis provides the samples of SWOT Analysis matrices Examples for Apple OS X.